Searching is the most important aspect of Searchdaimon ES. Getting started is quick and easy. A clean and simple user interface gives you search results in seconds. ES supports advanced functions such as filtering and sorting. In the above picture, you can see the results of the query "enterprise search". The search has been further broken down to only include documents from the "Sales" collection. You can also filter the search to only include documents from a file type like Excel or PowerPoint, or from a date interval like this year or older than two years. Above you see a search which gives hits in a holiday schedule. The schedule is a structurized list in SharePoint. We can see that Runar Buvik is entered for a trip to the Netherlands from 07-11-2009 to 07-25-2009. 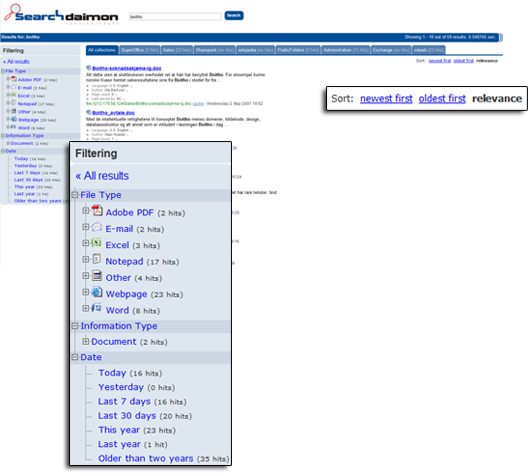 Searchdaimon ES suggests query words while you are writing. The words proposed are fetched from documents the user has access to, so that domain and product names, which you can't find in traditional dictionaries, are included.